In the close-knit international school community, filled with diverse cultures and backgrounds, students often make friends not only within their schools, but also with their peers at other institutions. As they move on to universities and careers, these bonds often strengthen and grow. 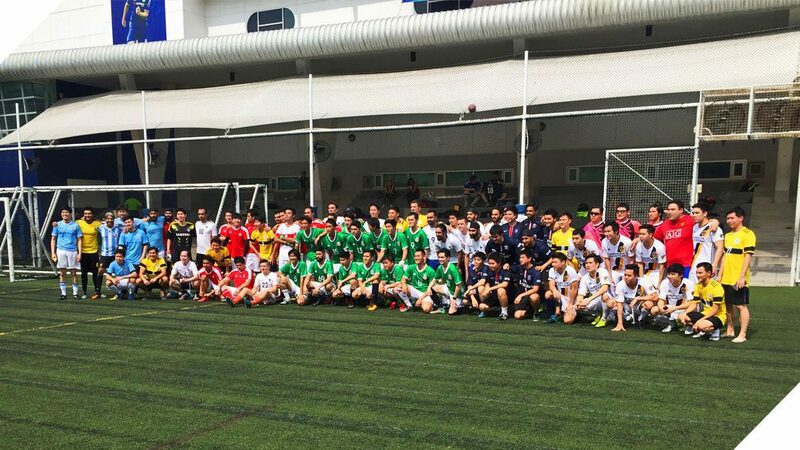 The strong connection they share was evident on Sunday, 8 May as more than 150 alumni from eight schools joined together at NIST for the school’s second Inter-School Alumni Soccer Tournament, hosted by the NIST Alumni Association. When the event was first held last year, the veteran NIST Falcons competed against their former rivals at International School Bangkok (ISB), Bangkok Patana School (BPS) and a few others. The friendly games were so well-received that word began to spread among the alumni community, and this past weekend the NIST alumni were joined by peers from ISB, BPS, Harrow International School, Ruamrudee International School (RIS), Ekamai International School, International Community School (ICS) and St. John’s International School. Also joining by invitation was a team from Sasin Graduate Institute of Business Administration. Cheered on by even more of their friends and supporters, the alumni teams squared off in a series of matches. The NIST veterans pulled through with narrow wins against Harrow, ICS and RIS to reach the semi-finals. Facing the MBA graduates of Sasin, they stormed to a 3-1 victory before challenging ISB in the final game. With the day coming to an end, the NISTies earned a 2-0 win and their first alumni championship. The NIST Alumni Association, now more than 1,500 strong, has expanded worldwide as the school’s alumni settle in the United States, Europe, Asia and here in Thailand. By maintaining close ties to one another, and to alumni of other international schools in Bangkok, they’ve helped build a rich legacy for NIST, one that has helped the school develop a reputation for excellence…whether on the soccer field or in the classroom. Through the alumni tournaments, reunions and other events, the NIST Alumni Association has created the seeds for a truly international community, one that welcomes all nationalities, all backgrounds and all creeds.